We've all seen or maybe we even have one of the cars that has grey primer on a fender. Every month we get a few of these cars so I thought I'd talk about them a bit today. How they end-up looking like they do is that someone rings your door bell or approaches you in a parking lot and says that they can fix the dent for a nominal amount. They make a show of pounding sheetmetal, drilling holes, smearing putty & spraying "primer." Then they tell you, "All you need to do is get the car painted." We are sorry to report that most of the people doing these "repairs" are con artists. They do more damage than good. They hide dents with a thick layer of (hopefully) automotive body filler. 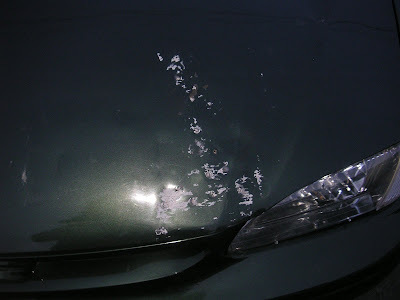 I say "hopefully" because we have seen cars with spackle, gunnite & even cement applied to them.--it is not possible to get a smooth or reliable paint finish over these materials and some of this stuff is extremely difficult to get off. 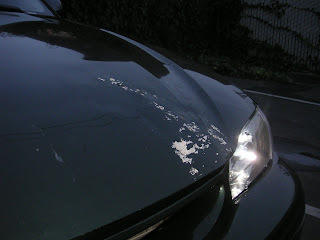 The reason they often spray 2 shades of paint on the dent is to make it hard to see that the surface is still lumpy. When a bodyshop gets these cars, it is difficult (and painful!) 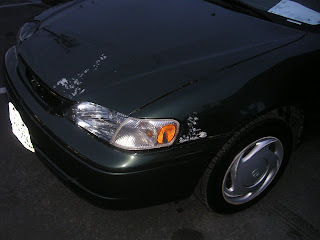 to explain to the vehicle owner that they were swindled and additional work is necessary before the car can be painted. Often we have to undo damage that the other guy caused. So the price is higher than it would have been if the owner had come to us in the first place. As I'm sure you can imagine, customers often look at us like crooks when we ask for money to fix something that has already been "fixed!" The pictures on this page show what the problem is. The owner of this Toyota Corolla paid someone to repair the car before they brought it to Almost Everything Autobody. In this case, the owner realized there was a problem and stopped the repairs before things got any worse. This allows us to see some of the issues before they were covered-up with spackle & spray paint. The person doing the "repairs" drilled holes in the body panels--this is a big problem. It reduces the strength of the panel and allows rust to start forming from the front, back and inside the panel itself. Decades ago drills were typical in auto body repairs but technology has advanced significantly. Don't let someone drill into the body of your car. Next, he put screws in the holes and yanked on them to try to pull the dents out. What is bad about this is that where there was one bigger dent now there are lots of little dents plus ragged holes that look like miniature volcanos. It is much more difficult to achieve a smooth surface over lots of small dents. It also takes more time & expense to repair multiple small dents than to straighten an equal area with a single, large dent. Worse, the ragged edges on the holes further degrade the integrity of the panel and provide more nooks & crannies that rust just loves. If the owner had not stopped him at this point, he would have applied a thick layer of bondo (or some other filler) to hide the various holes & dents. Body filler is a useful and necessary part of body repair. But it must be kept to a minimum. It can't provide the strength of steel, aluminum, fiberglass or carbon fiber. It is somewhat flexible so it expands and contracts as the base material flexes, heats & cools. In a thin layer it makes everything look smooth. In thick, uneven layers, it will crack and come apart over time. Now, if you were unfortunate enough to have been caught in this trap, we're sorry. Please don't be embarrassed. You are NOT alone. Like I said at the beginning, we see a lot of these cars and I personally know a lot of very intelligent people who have been victimized in this particular scam. The good news is that Almost Everything Autobody is great at getting your car looking good again at the lowest possible price. Drop by & we'll give you a free written estimate.